I made a second stop at my favorite consignment/thrift store today, and found three figurines (just before closing time) that came to $9.09 with sales tax. Anyway, my new to me, vintage figurines, look like 1700's French nobility. I normally don't buy the gentlemen figurines, but I thought they made a nice pair. 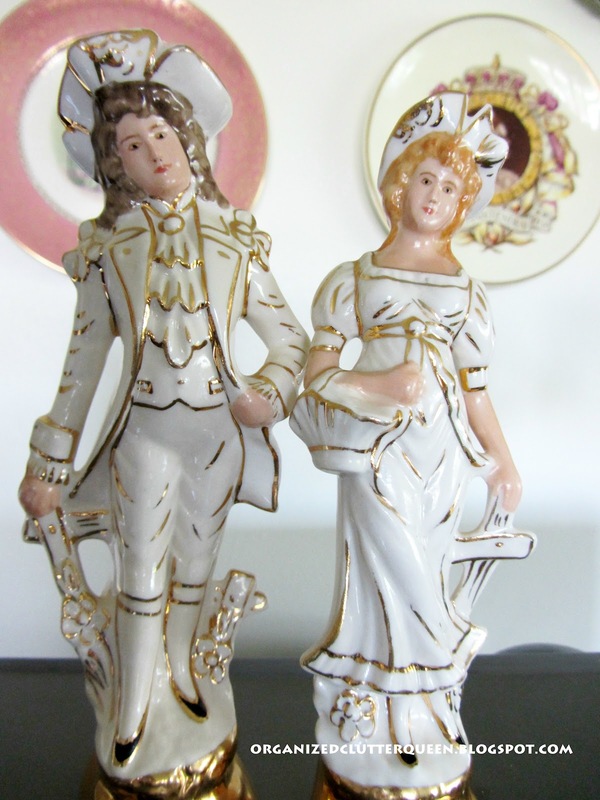 They are unmarked, shiny white ceramic with lots of gold trim. I think they were probably made in Japan. Correct me if I'm wrong! They are in perfect condition. They were extremely hard to photograph because the glaze is very shiny. Maybe lustreware. 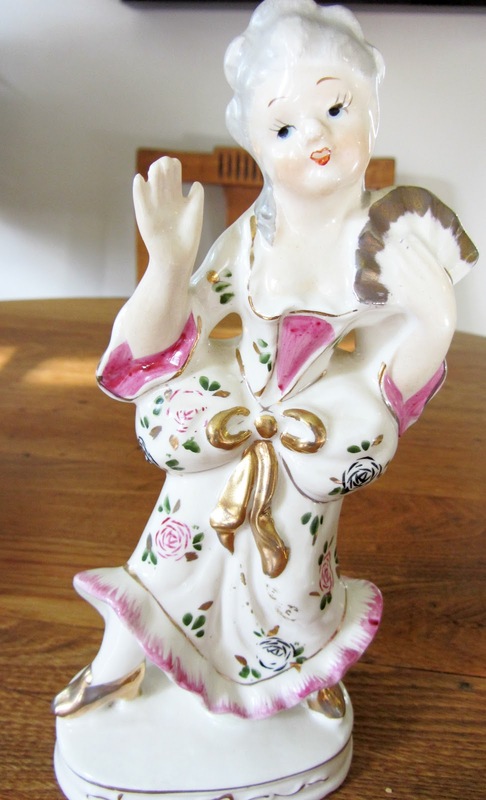 Also picked up another lady figurine, and this one was marked Japan. 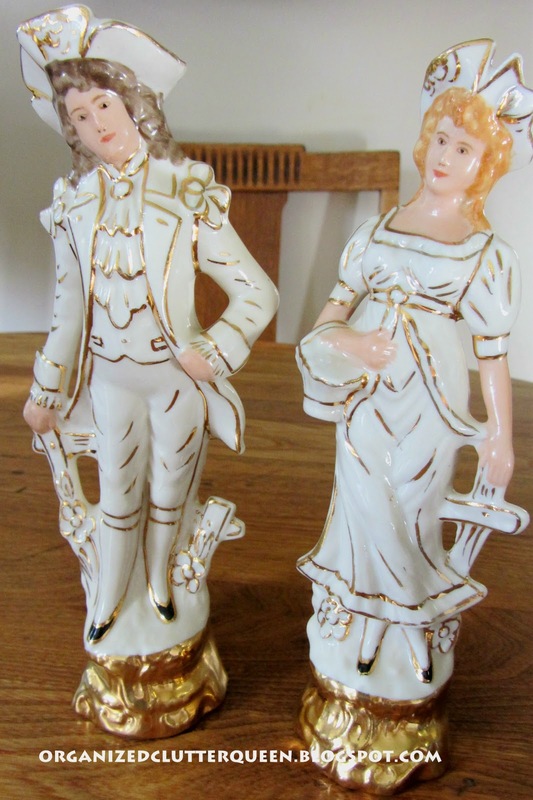 Old fashioned lady figurines (and one gentleman) are great, inexpensive collectibles. I DO use mine. I like to introduce them into my tablescapes and have some fun with them! They would look fantastic with some of your cups and saucers. "I WOULD HAVE BOUGHT THESE TOO"!!! I'm a JEANS kind of gal BUT I LOVE these Victorian era costumes. Thank you for sharing them, They were a fantastic find! I love the sweet painted face on that last figurine! It reminds me of my Lefton angels. Oh, I love them! I have lots of lady figurines - especially Christmas ones that I display each Christmas. Thanks for sharing. 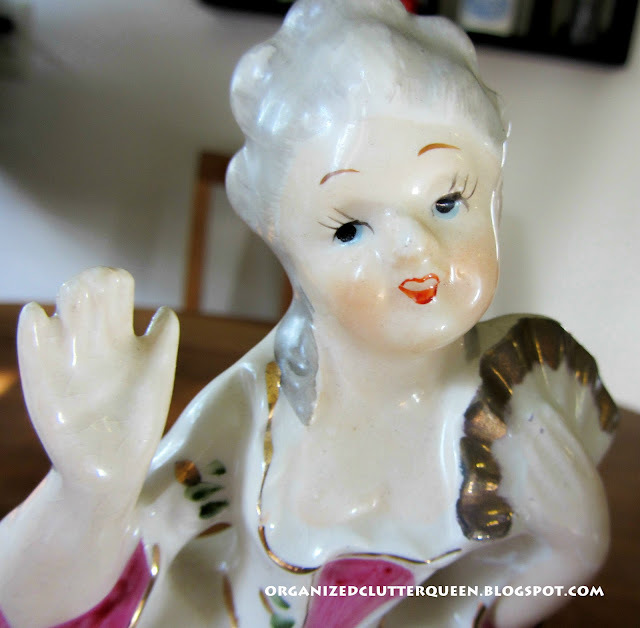 I collect lady headvases and have around 50 of them..Love them all! !